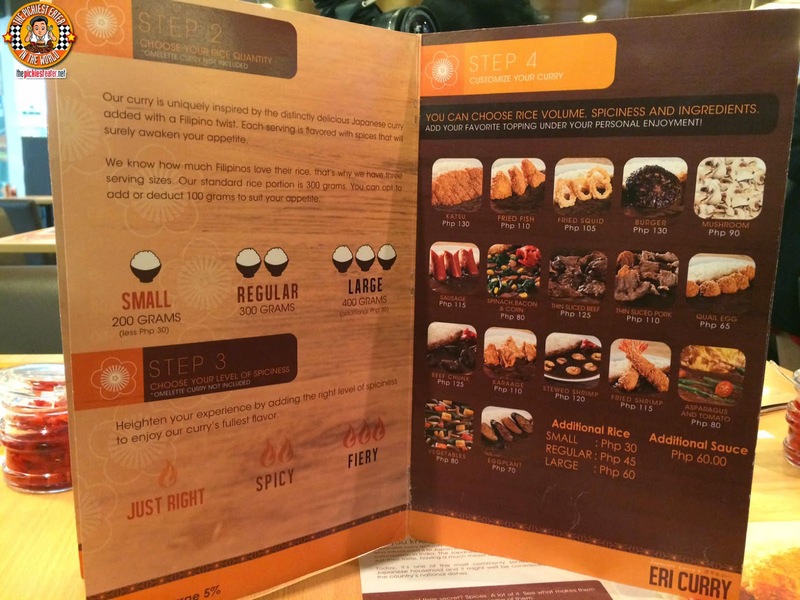 THE PICKIEST EATER IN THE WORLD: GET CURRIED AWAY AT ERI CURRY! GET CURRIED AWAY AT ERI CURRY! I really enjoy Japanese Curry. 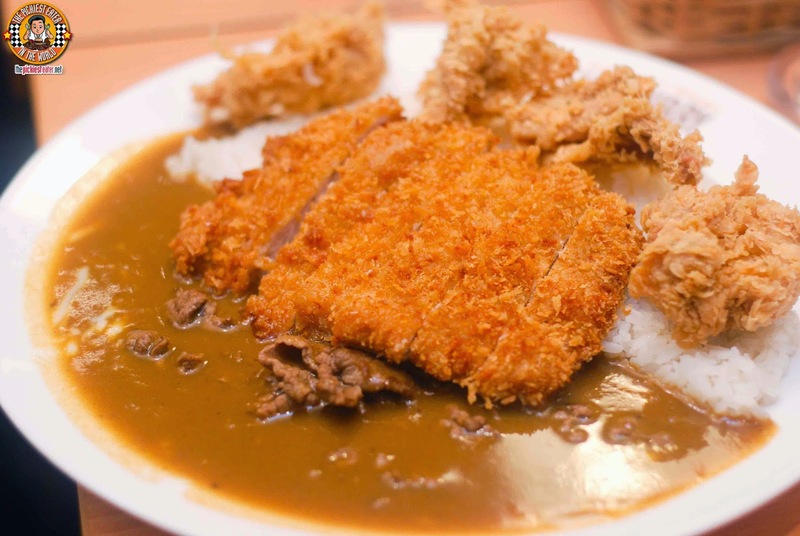 Truthfully, I enjoy Curry in general, whether it be Thai or Indian, but I find the heat of Japanese Curry the most manageable for my taste buds, not to mention, without it upsetting my stomach at the same time hehe. 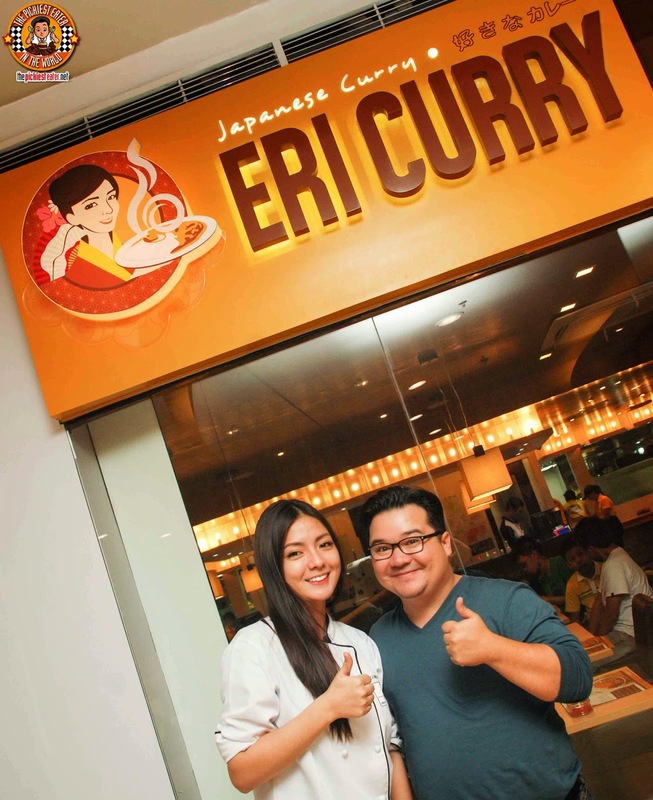 I was elated to discover that a Japanese Curry House recently opened at the SM Mega Atrium. But more than anything, it was the concept of that Curry house that appealed to me most. 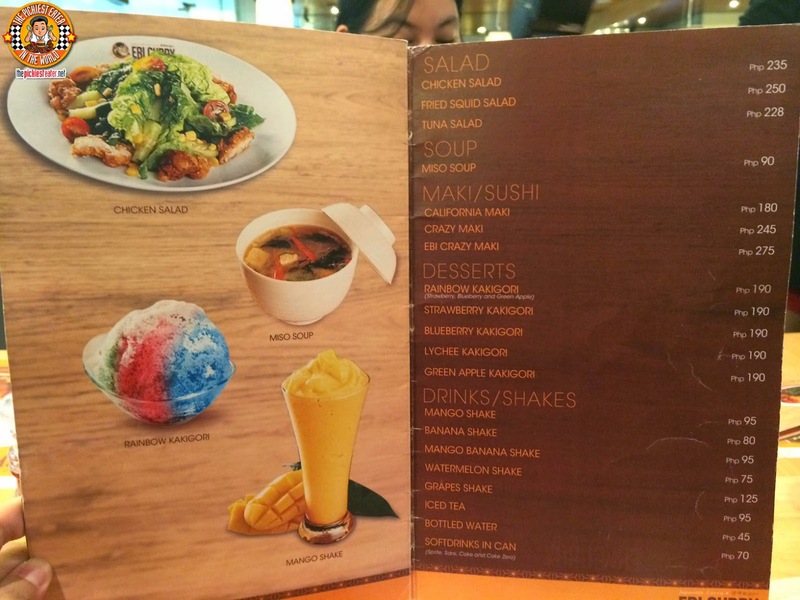 A Curry place that lets you customize practically everything about your dish order, to the point that the only thing that seems to be lacking is the option to choose the color of your own plate. Friends, prepared to get Curried Away at Eri Curry! Eri Curry opened their doors in late July of this year, but has already made a name for themselves as having the most flexible menu among its curry house contemporaries in the metro. Head Chef Erica, proves that she's a lethal combination of beauty and brains, and is the Vanguard of the dishes of Eri Curry. Inspired by her years living in Japan as a young girl, Chef Erica parlayed her love for Japanese Curry dishes into a culinary career path.. The result? Eric Curry was born. 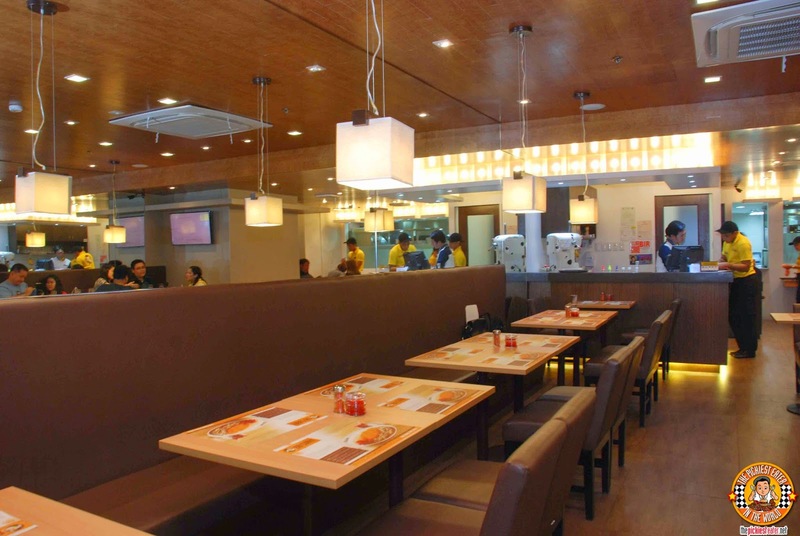 With its simple, yet classy interiors, Eri Curry has a relaxed, casual vibe. Truthfully, I was very impressed with what I saw, I immediately assumed that this was an international franchise. I was delighted to discover that, despite its global caliber feel Eri Curry is indeed a local concept restaurant. 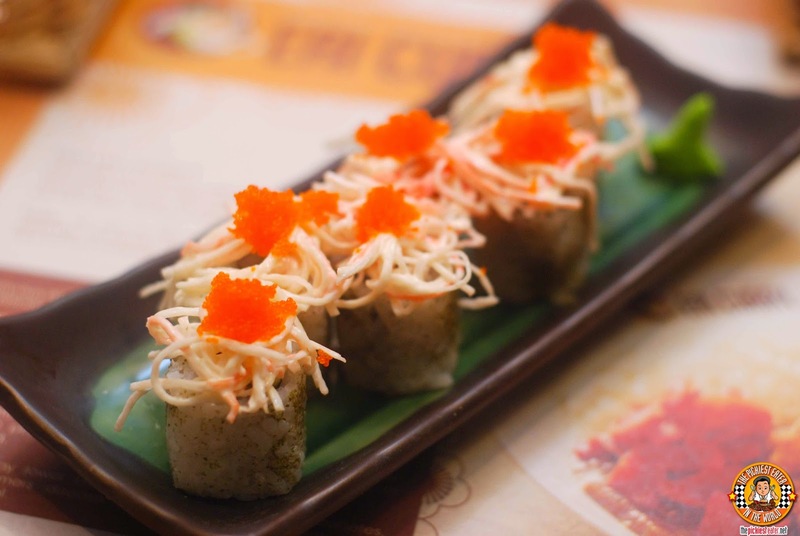 As we began our meal, we were offered two starters, the California Maki (P180) and the Crazy Maki (P245). I'm not a fan of sushi, but Rina loves California Maki, and took to this immediately. 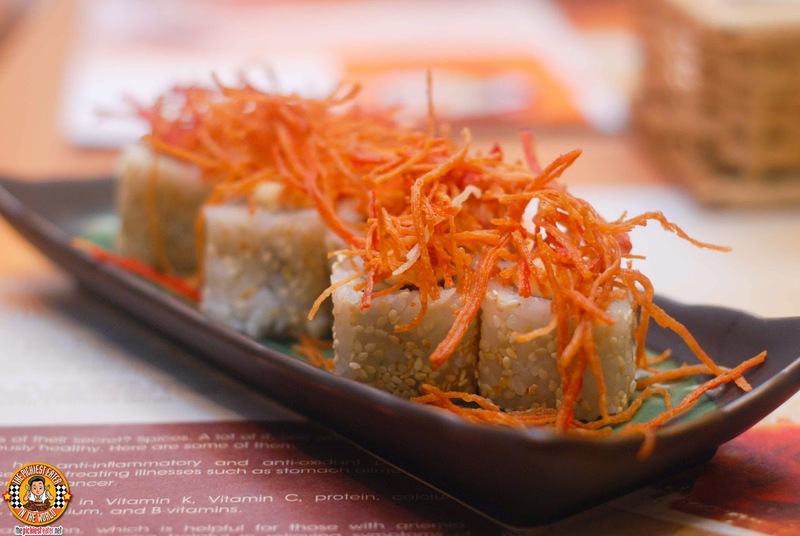 The Crazy Maki was a rather unique take on the California Maki, as it is topped with deep fried, shredded Kani. I was so focused on the main dishes and all the Curry Combinations I wanted to come up with, I practically ignored the starters! 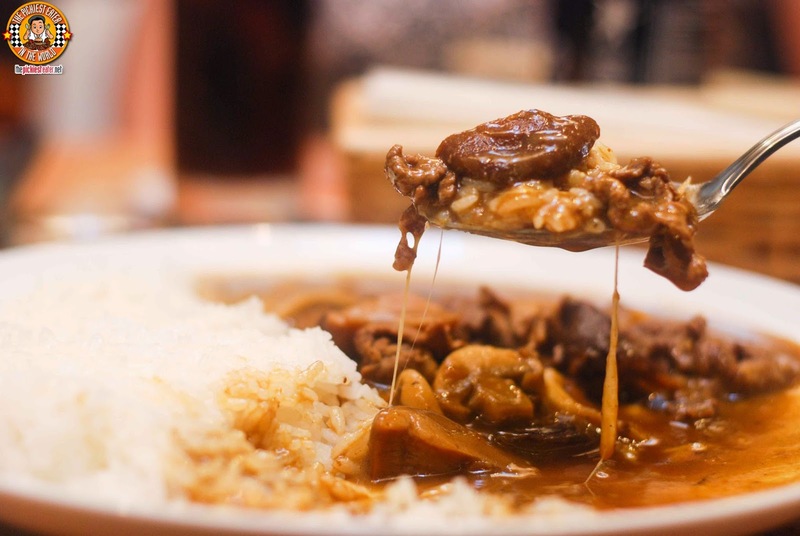 But I'm getting ahead of myself.. let me start from the beginning (Which according to Julie Andrews, is a very good place to start)..
Let's face it.. Japanese Curry dishes are usually best enjoyed with piping hot white rice. But everyone's capacity for rice varies (Would you believe Rina actually eats more than me? I'm eat more ulam though hehe). Your curry experience begins once you select your base dish that will serve as the foundation for your meal. 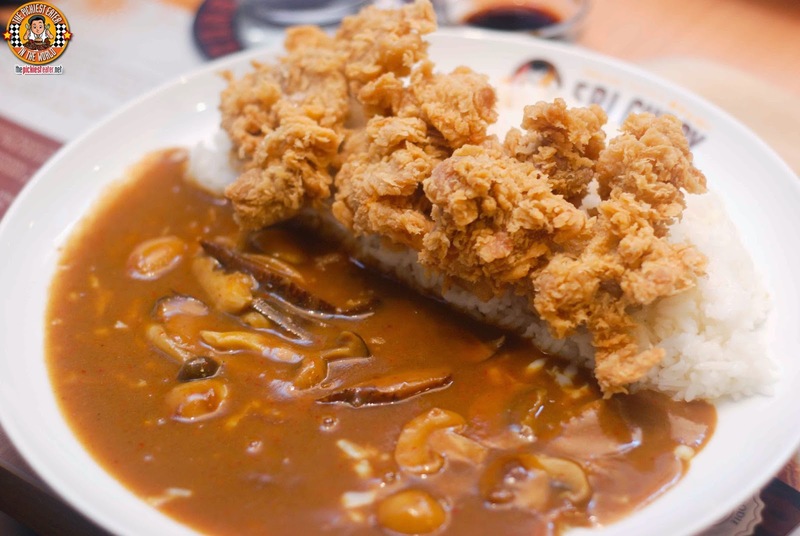 Eri Curry currently has 15 Curry Meals for you to choose from, Ranging from meaty variants such as Katsu, Chicken Karaage, Hamburger Steak and Sausage, to seafood dishes such as the Fried Fish and Fried Squid Curry. Even Vegans will be elated to know that there are Vegan-Friendly dishes such as Eggplant Curry, Mushroom Curry, and Mixed Vegetable Curry. 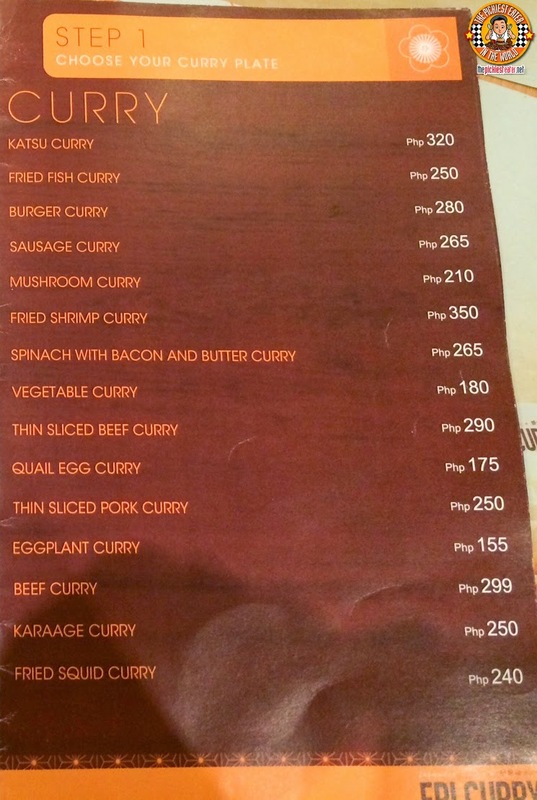 The most expensive dish is a very reasonable P350 for the Fried Shrimp Curry, and the lowest priced dish being the Eggplant Curry (P155). 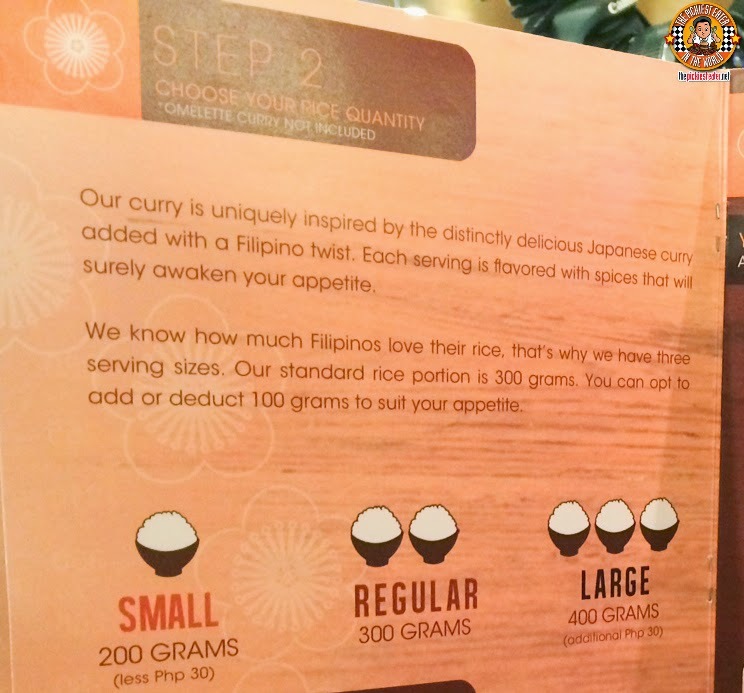 Though they specialize in Japanese Curry, Eri Curry understands its Pinoy market very well, and how we hold importance to rice in our daily diet, as well as getting the best value for our meals. Your next step is to select how much rice you want with your meals. The standard serving is 300 Grams, which is about the equivalent to 2 cups of rice. The beauty of this option is that you may choose to order a Small serving of rice (200 grams), and they will deduct P30 from the price! 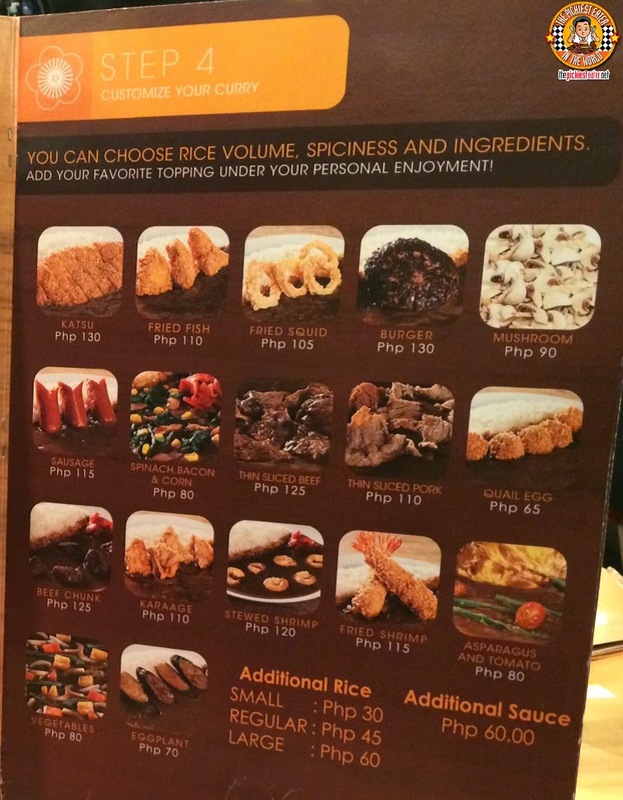 Ordering the Large serving of rice would in turn, entail an additional P30. I'm not a heavy-on-the-rice kind of guy, so the small was perfect for me! But word of advice, the sauce itself goes perfectly with the rice, so as we Pinoys love to say, "Mapapa-kanin ka talaga" (You'll end up eating loads of rice). The third step - and this is an important one - is choosing your level of spiciness. I stress this being important because if you're like me, and your taste buds can't handle heat too well, it could throw a wet blanket on your meal. I chose the "Just Right" level.. Which had the level of spiciness down to virtually nothing. The "Spicy" option had me gulping down a few sips of water after every bite, while I didn't even bother trying the "Fiery" any more, as I assumed it would taste like licking the surface of the sun. I suggest that if you've got weak taste buds go for the "Just Right" option and adjust the level of Spiciness yourself with the chili powder that is provided as a free condiment in your table. 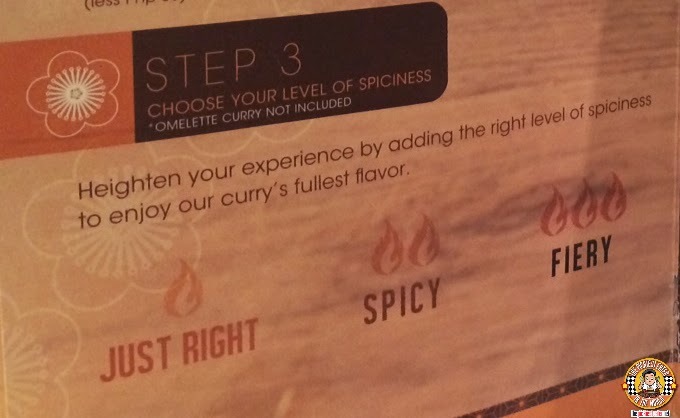 I also feel that it would be nice if Eri Curry could come up with a "Mild Option".. Somewhere in between "Just Right" and "Spicy". Just enough to give your taste buds a little kick, but not enough for you to be reaching for a drink every ten seconds. 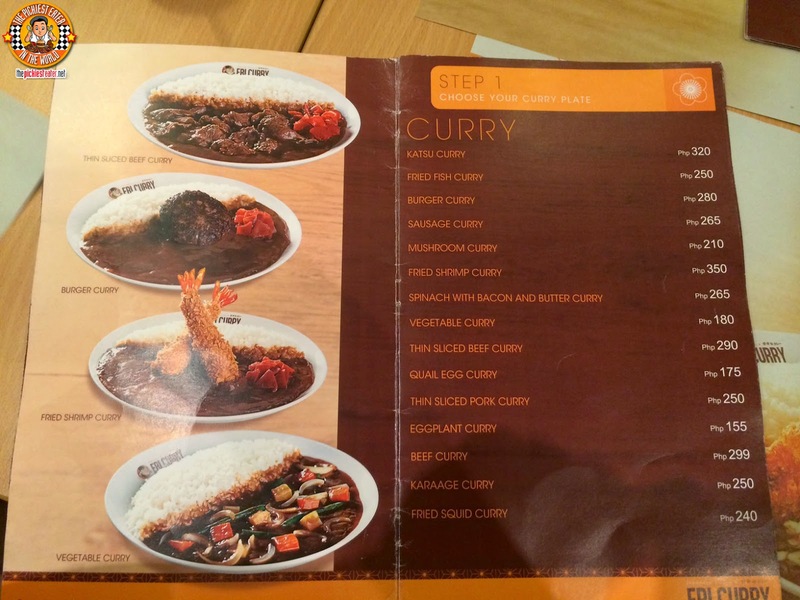 STEP FOUR: CUSTOMIZE YOUR CURRY! My favorite option is the last one.. Customizing your Curry! What sets Eri Curry apart from the rest, is how you are given the ability to customize your meals to your liking. We've all been there... You know you want that Burger Steak, but you're also wondering if the Sausage is any good.. But you're worried you'd be missing out on the beef.. and sometimes, you just want to flat our order everything on the darn menu! Well, Eri Curry has solved that problem for you! You may TOP your existing Curry plate with side dishes.. Dishes that basically make up the OTHER Curry plates.. all for a much cheaper price! You want an extra piece of Pork Katsu with your Beef Curry? Why not?!! How about some Fried Shrimp to go with your Burger Steak? Hell yeah!! Your combinations are limited only by your imagination and of course, your budget! 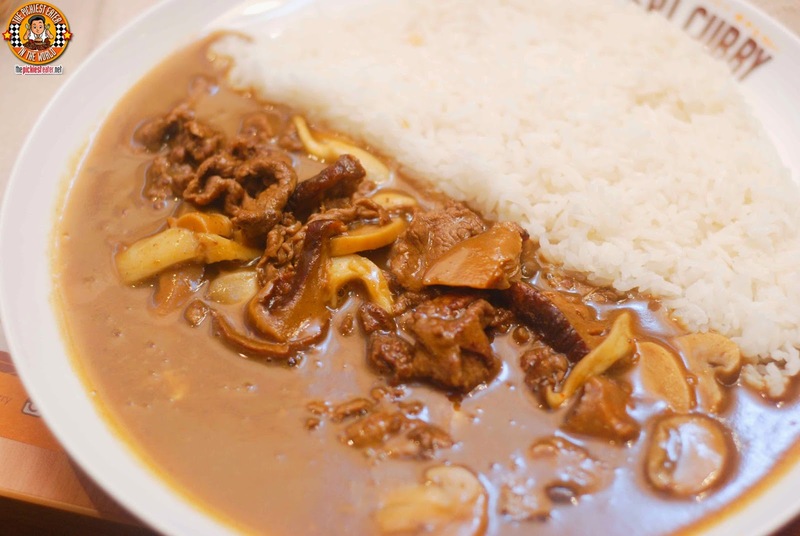 Rina ordered the Beef Curry plate with extra mushrooms! The moment Rina saw it, she found it mouth-watering, but with Rina being Rina, she couldn't resist but comment to me, "I bet this would be even better with Cheese...". And you know what? She was right! The sauce had a delicate sweetness that amplified the scintillating flavor of curry. This reaffirmed to me that, Chef Erica definitely knows what she's doing. My buddy, Hefty Foodie ordered the Beef Curry as well... But with a Katsu and Karaage .. Umm... "Topping". (He earned his name for a reason). The Katsu is not near the quality of Yabu, but definitely tasty in its own right. I enjoyed the crunchiness of the Karaage, which gave way to the juicy chicken meat. My dear Kapatid Shen ordered the Beef Curry with Mushrooms and Chicken Karaage.. 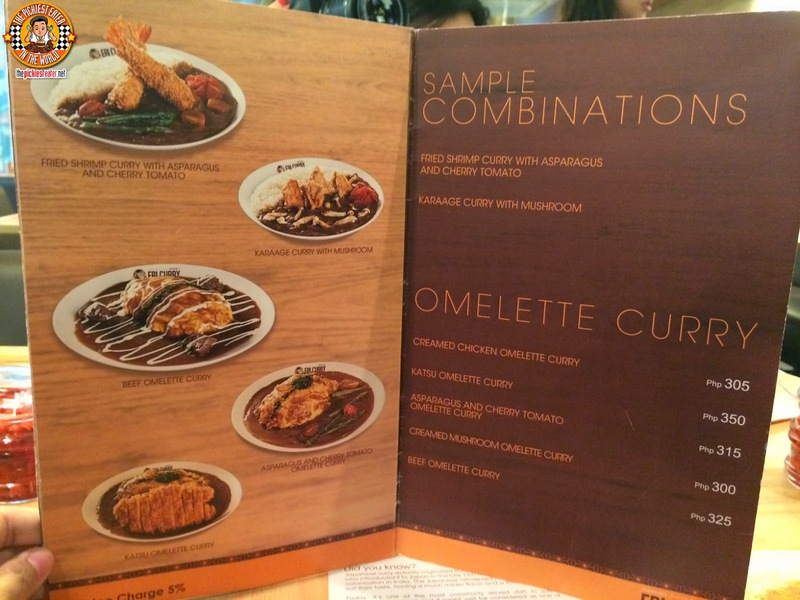 Since everyone was doing the Curry plates, I decided to venture off the path and try Eri Curry's Omelette Curry Menu. 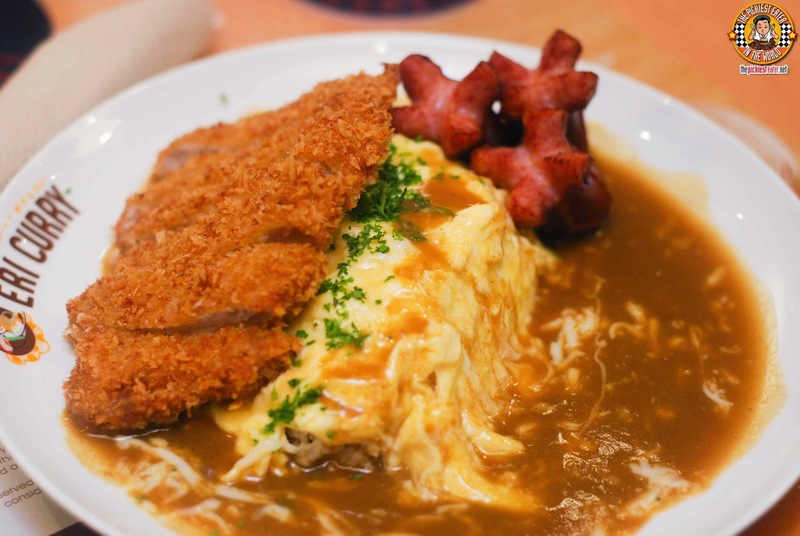 I ordered the Katsu Omelette Curry (P350), which they allowed me to add on some Sausage.. And I'm so glad they did because their sausage is incredible! They may look like little hot dogs at first glance, but don't let those little bad boys fool you! It's backed with so much tender juiciness, it almost made Purefoods jealous! The fluffy creaminess of the egg worked magically with the sweet touches of the Curry sauce, and was brought together by the steaming white rice that it had blanketed. 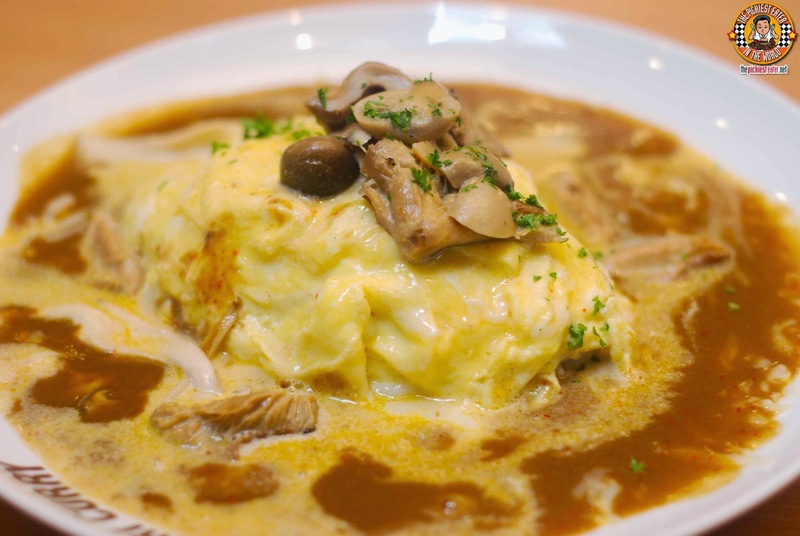 My other foodie buddy, Tales from The Tummy, ordered the Creamed Mushroom Omelette Curry, which was simple, yet satisfying nonetheless. 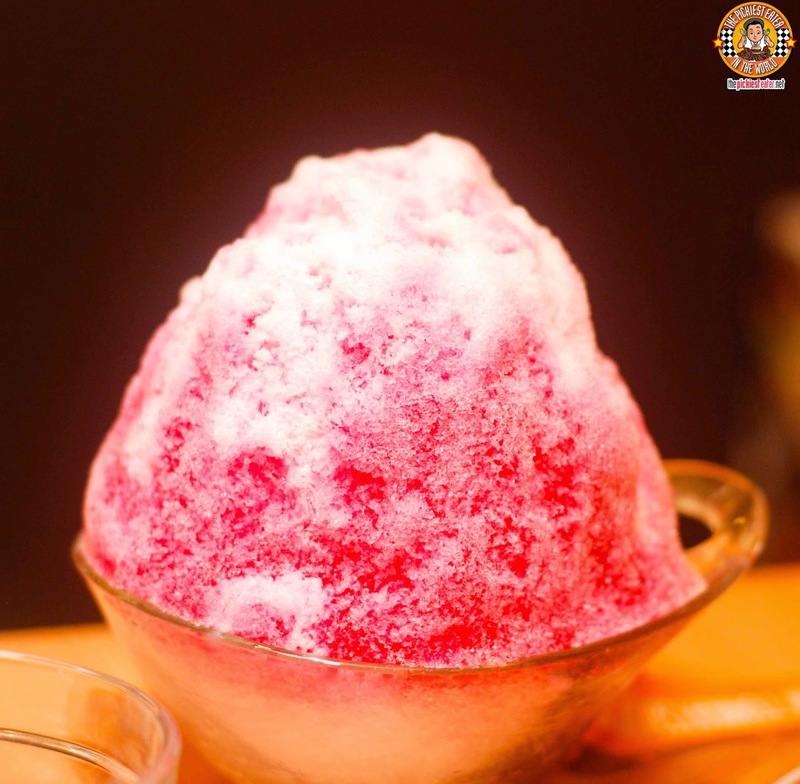 For Dessert, We tried their selection of Kakigori.. A popular Japanese Shaved Ice Dessert. 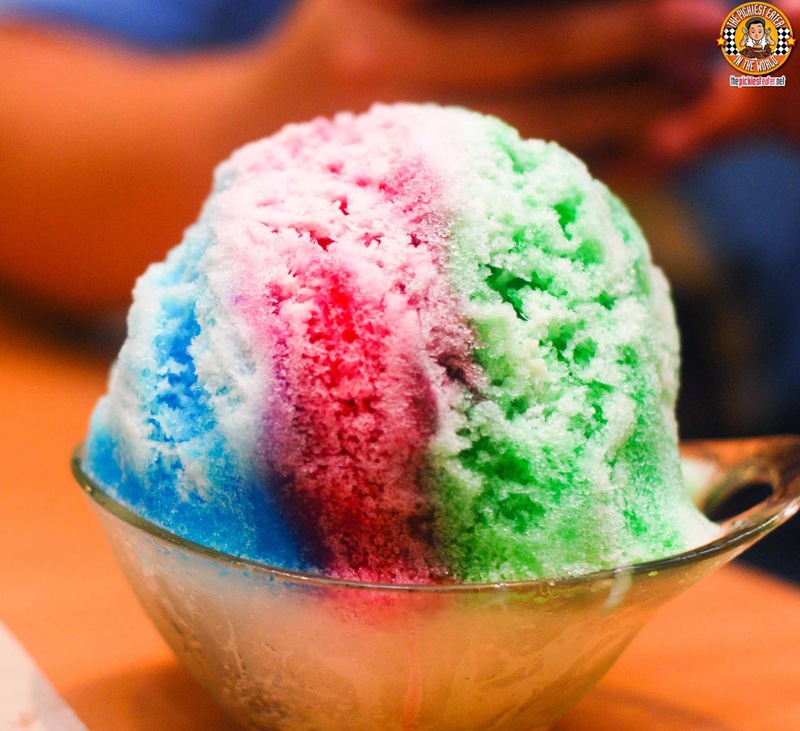 The mountain of Shaved ice is dressed in a Strawberry Syrup (P190) , or in the case of The Rainbow Kakigori (P190), A variety of syrups (Strawberry, Blueberry, and Green apple). Digging into this feels sort of like a delicious archaeological dig, because once you reach the center, you discover the delicious red beans and super creamy condensed milk. Truly a refreshing way to end an incredible meal! 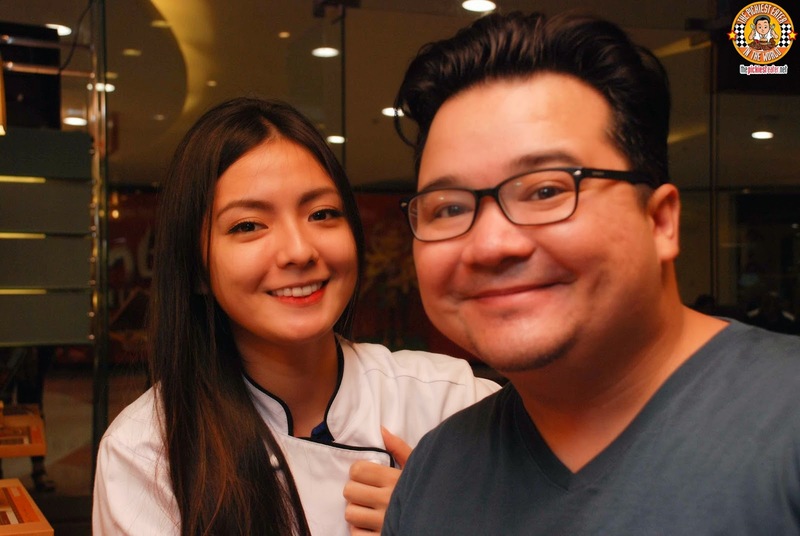 It was a pleasure to meet the unbelievably talented Chef Erica, who amazed us all with culinary talents that belied her young age. I'm looking forward to more of her delicious creations in the future! And it was great to see my sister from another mister, Shen of Shen's Addiction after a long time! See you again soon, Kapatid! I've been to Eri Curry twice since my first visit.. and each visit got better and better.. Though they are a new restaurant, the service was excellent and the food, which I can understand can be a bit more complicated to dish out due to the possible combinations, was usually served at a reasonable time. I'm looking forward to going back again soon! 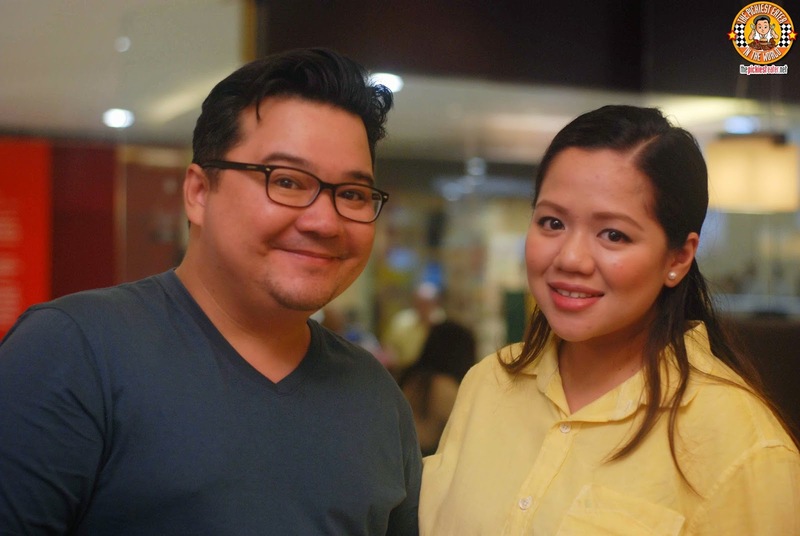 SAY ALOHA TO TEDDY'S BIGGER BURGERS IN GREENBELT! CHILI'S YOUR WAY: MORE FLAVORS, MORE CHOICES! ENJOY A TEX-MEX FIESTA GRANDE AT OAKWOOD! BDO’s TREAT! 45% OFF LUGANG CAFE!